NEED IT FAST?? We ship most orders in 2 business days! The Tile Mural Store offers the LARGEST selection of decorative wall tile murals and single tile accents. Here at The Tile Mural Store you will find both kiln fired tile murals and accent tiles (USA location only) AND completely customizable tile murals created from the digital reproduction of original artwork, paintings and drawings. Adding a decorative ceramic wall tile mural to your home really makes a statement. Show off your own individual taste and stye with our decorative wall tile murals and accent pieces. Here you will find thousands of tile mural selections for kitchens, backsplashes and bathrooms. 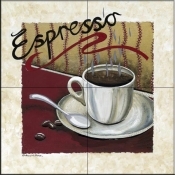 We have the largest selection of both kiln fired and digital artwork tile murals available anywhere. 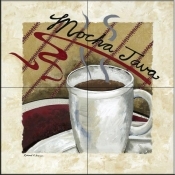 We also offer three ceramic tile finish choices for the digital art tile murals and accents - high gloss, satin and matte. We offer two ceramic tile finishes for the kiln fired designs - gloss and matte. Click here for a quick overview of the tiles types we offer. Both our kiln fired and digital artwork tile murals can be used as a backsplash behind your stove or sink in the kitchen and as a tub or shower surround for your bathroom. Our kiln fired tile murals and accents can be used on countertops, table tops and outdoors even around a pool (kiln fired images are products that do not start wtih the number 15). 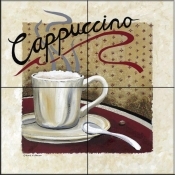 The Tile Mural Store offers tile mural and backsplash designs for any decor and taste. If you are remodeling your home or building a new home consider the lasting beauty a tile mural has to offer. For kitchen backsplash and walls take a look at our tile murals and accent tiles of fruits and vegetables. We have fruit designs of grapes, apples, berries, peppers, peaches, plums and so much more. We offer many vegetable tile murals and single tile accents as well with tomatoes, corn, scallops, onions, garlic, potatoes, eggplant and so much more. 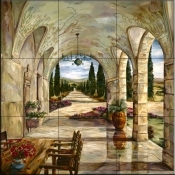 If you like wine then take a look at our gorgeous red wine tile murals and white wine tile murals. Everyone knows that a great wine deserves a great cheese so be sure to check out or kitchen tile mural section for the perfect cheese tile mural. If it's a bathroom you are remodeling or designing for then browse our bathroom tile selections of sea life including tile murals of dolphins, whale tile murals, fish tiles, sea turtle tile murals, coral reef tile desgins, and of course ship tile murals and lighthouses on tiles. nautical tile murals and tiles of sealife are perfect for bathroom walls, as a tub and shower surrounds. For your kitchen and bathroom browse through our decorative landscape tile murals and see tile murals of lakes, seascapes, woodland scene tiles, streetscene, tuscan tile murals and tile murals of gardens and flowers.